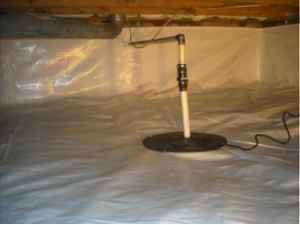 Save your Home by waterproofing your Crawl Space! Crawlspace Waterproofing is a practice best performed properly during construction of the home. An external footing drain and waterproofing the foundation walls is best achieved before backfill of the soil around the foundation. Gutters and downspout extensions help extend rain water away from your home’s foundation. 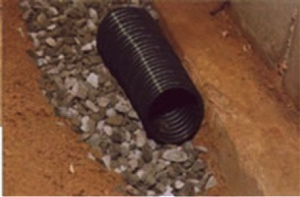 All of these techniques are necessary to ensure water from entering the crawlspace, but many builders do not install the systems or the systems fail due to improper installation. Upgrading these systems outside of the home when applicable is a good practice, but may not prevent all of the water from entering the crawlspace. At this point, water management inside of the crawlspace is necessary. The best crawlspace waterproofing method is to install an internal perimeter drainage system. The first step to waterproofing wet crawlspaces is to install drainage and a sump pump system. A water management system in the crawlspace will ensure water doesn’t pool in the crawlspace which causes high humidity levels. The next step to waterproofing the crawl space is a crawl space vapor barrier system. Contact us today for your free, no obligation crawl space waterproofing quote! 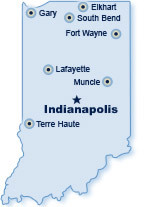 We serve the Greater Indianapolis Area and many surrounding areas, including Avon, Carmel, Fishers, Noblesville, Bloomington, Columbus, Greenfield, Plainfield, Mooresville, Martinsville, Greenwood, Franklin, Columbus, Terre Haute, and nearby. Think you may need a crawl space waterproofing system? Contact Indiana Crawlspace Repair! Let us start saving you money today – our crawl space waterproofing installation contractors are just a call or click away!